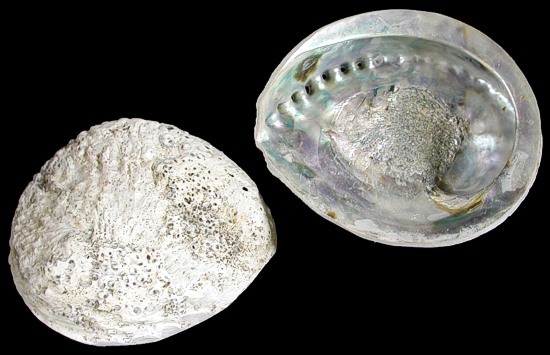 Abalone are mollusks having one-piece shells. They once abounded along the southern California coast, but were over hunted by humans in the 1950’s – 1970’s and decimated by Withering Foot Syndrome in the 1980’s – 1990’s. Because of this, the taking of abalone is prohibited from San Francisco Bay south. From the Bay north, it is highly regulated by the California Dept. of Fish and Game. Long time coastal residents will often have abalone shells around their homes, inside and out, and will tell you of delicious abalone dinners. Abalone shells are rounded or oval with a large dome towards one end. The shell has a row of respiratory pores. The muscular foot has strong suction power permitting the abalone to clamp tightly to rocky surfaces. An epipodium, a sensory structure and extension of the foot that bears tentacles, circles the foot and projects beyond the shell edge in the living abalone. Five species of abalone occur off the California coast: black, green, pink, pinto, and red. Abalone are once again being found along the southern California coast, but it will be many decades before divers will be allowed to harvest them again.